Shenei Luchot HaBrit (the holy Shelah), words of ethics and awe, Kabbalah and Halacha, by R. Yeshaya HaLevi Horowitz; with Vavei HaAmudim by his son R. Sheftel Segal. Amsterdam: Immanuel Benveniste, 1648. First edition. Hundreds of lengthy glosses from an unidentified writer (in neat Ashkenazic script, from the time of the printing – ca. late 17th century). These glosses were recorded over the years in script of varying size (tiny to small-medium), and were presumably all written by the same writer who developed his work over the years, sometimes even writing glosses on his earlier glosses. These glosses make up a complete kabbalistic composition, written by a senior kabbalist, proficient in Kabbalah and the hidden realms of Torah (many glosses state: "and it appears to me that the meaning…"; "and it seems to me that the reason…"; "according to what is known to kabbalists…"). In his glosses, the author adds new commentaries, occasionally substantiates the words of the author, and discusses them. Different forms of allusion are employed extensively in his glosses: acronyms, numerical values and full spellings of the alphabet. He quotes teachings from various kabbalistic works, including books printed in the 17th century, ca. 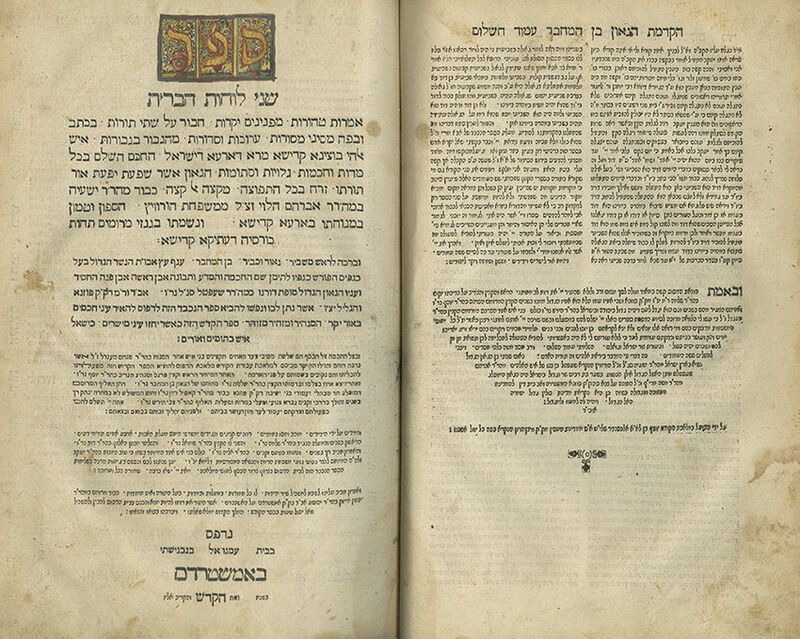 1637-1687: Chessed LeAvraham (on p. 102a); R. Shimshon of Ostropoli (on p. 208b); the Megaleh Amukot (on p. 238a); Shulchan Aruch HaAri – "the Shulchan Aruch of R. Y." (on p. 213a) and others. Various early signatures: "Shlomo HaKohen of Brody"; "Shlomo son of R. Yehuda Katz" (perhaps the above-mentioned R. Shlomo of Brody); "Avraham Dreznitz"; "Avraham son of R. Shimshon head of the Dreznitz community"; "I thank G-d very much… that I had the merit of acquiring the book… Shimshon son of R. Avraham of Dreznitz"; "I received this as a gift from my father-in-law… R. Shimshon Dreznitz, when I was appointed rabbi of [----] Prera (presumably Přerov, Moravia)"; "Avraham son of R. Beirach Shatz of Dreznitz, residing here ---". Signatures of R. "Yaakov Tzvi of Pressburg", "Yaakov Tzvi son of R. Binyamin Wolf Rabbi of Pressburg" appear in several places. R. Yaakov Tzvi was the son of R. Binyamin Wolf Jakerles, first rabbi of Pressburg in the early 18th century (d. ca. 1730), and brother-in-law of R. Avraham Broda (both were sons-in-law of R. Eliezer Lipman Grätz Rabbi of Bumsla, d. 1694). Handwritten inscriptions on p. 3a, recording births from 1728-1735, presumably handwritten by this R. Yaakov Tzvi. His second son, born in Tishrei 1732, was named "Binyamin Wolf" (presumably after his father, rabbi of Pressburg), and his third son born in 1735, was named Avraham (possibly after his renowned uncle, R. Avraham Broda who passed away in 1717). The Bach – R. Yoel Sirkis, notably acclaimed the author and his works, in his approbation to the Shaar HaShamayim siddur: "R. Yeshaya HaLevi… he left behind blessing in his holy compositions, as we have seen that when we read them, we sensed the outpouring of holiness in all our limbs, and this is the sign that his works were composed for the sake of heaven, to elevate future generations…". The Tosafot Yom Tov in his approbation to the siddur writes: "He is a holy, awesome man… no doubt he was invested with a heavenly spirit…". The Rayatz of Lubavitch brings a wondrous tradition from R. Mendel of Vitebsk regarding this edition of the Shelah: "When the Shelah was being printed, before it was completed, it was purchased as booklets, and this holy book enthused and inspired the hearts of the Jewish people, and the evil eye dominated it, and the infamous Chmielnicki massacres ensued" (Likutei Diburim HaMeturgam, I, p. 50). The Rayatz writes there about the second edition of Shelah as well, which was published in 1698 (see next item): "In the year the Baal Shem Tov was born, the second edition of Shelah was printed in Amsterdam, and then as well there was an accusation in heaven against the Jewish people in Poland, similar to the first accusation upon the initial publication of the Shelah, yet ultimately, it was a year of serenity". , 44 leaves; , 2-421 leaves. 30 cm. The title page border and the ornaments surrounding the headings throughout the book were painted in various colors. Good-fair condition. Stains and wear. Tears to first title page and several other leaves, repaired. Some glosses slightly trimmed. New, elegant leather binding.